Little bright green turtles, with their stumpy tails, gnarly claws and pointy noses aren't the ideal pet for everyone. They don't interact much with humans, spend the day not doing much, and can spread salmonella bacteria. If you love turtles despite these things, however, the good news is that they are undemanding and straightforward to raise. Many turtles are called green turtles. 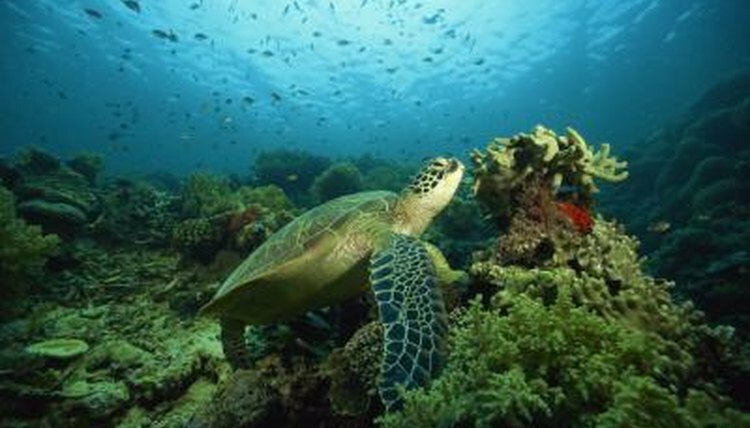 Officially, only sea turtles have the name "green turtle" or "green sea turtle." These massive turtles are endangered and are not kept as pets. Freshwater turtles, however, like red-eared sliders, painted, yellow-belly sliders and cooter turtles are commonly called green turtles, even though that is not their official name. These kinds of turtles are kept as pets and are widely available at pet stores and aquariums. Green freshwater turtles require a large aquarium with a swimming area, a shallow pool and dry land. Your turtle can be happy in a 30 to 50-gallon tank as long as at least half of the living space is water. Provide a heating lamp to keep the tank between 75 and 80 degrees Fahrenheit. Run an ultraviolet, or UV, lamp at least 12 hours per day to stimulate your turtle's body to produce enough vitamin D. Add plants, branches and rocks to the enclosure so that your turtle has a place to hide, but be sure that the plants are not toxic. A mixture of leafy greens, protein and commercial pellets will keep your green turtle healthy. Lettuce, kale and cabbage are good choices, and can be supplemented with celery and broccoli, but are only part of a good diet. Protein is vital for nearly every type of turtle. Offer shrimp, nightcrawlers, brine and small live fish as a source of protein. Make sure your turtle gets some leafy greens and some protein each day. Commercial pellets contain essential vitamins and nutrients that a domestic turtle might not otherwise consume. These pellets should be at least 25 percent of your turtle's diet. A clean turtle is a healthy turtle. Use a good filtering system to keep water as fresh as possible. Change at least half of the water in the tank every day if you don't have a filtering system. Otherwise, change the water once every two weeks. The bedding, or sand, should also be removed and replaced once every month. A clean tank prevents common bacterial illness, like respiratory infections and shell rot.